SIGNED Limited Edition Framed Print. Multi-Color lithograph printed and published by Tyler Graphics Ltd. Limited edition of only 70. Dimensions: 42-1/2" x 32-1/2" sheet, 39" x 29" image. Professionally framed with archival materials and Plexiglas in natural wood (48" x 37-1/2" x 2). SIGNED and numbered' 66/70' in pencil by artist on recto (lr). Another impression from this edition is in the collection of the Walker Art Center (WAC), Minneapolis, MN and the Tate Britain, London, UK. 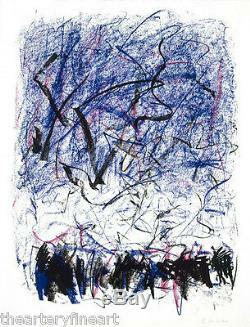 Joan Mitchell, while having expolored printmaking throughout her four-decade career ultimately made relatively few prints. However, Mitchell's prints maintain the complexity, intensity, fluidity of line and abstract marks that have become synonymous with the visual language of her work. Although this print is heavily abstracted, there are strong traces of the natural world, as the title indicates. Dense bands of marks at the top and bottom of the paper can be seen as river banks. The lightly-worked areas between suggest the water of the river itself. In 1981, Mitchell produced ten large lithographs collectively titled the Bedford series after the workshop's Bedford Village location in New York. Keen to facilitate Mitchell's drawing process, Tyler provided her with clear sheets of Mylar, which, when layered over one another on the studio wall, allowed her to view the entire image at once and thus work with greater immediacy. For the printers, this served the dual function of creating instant color separations, which could then be directly transferred to photosensitive lithographic plates for proofing. Mitchell harnessed Tyler's innovative technique to expand her printmaking palette and incorporated up to ten colors in one work, marking a significant break from the more subdued tones of earlier prints. Mitchell is recognized as a principal figure and one of the few female artists in the second generation of American Abstract Expressionists, after the aesthetic breakthroughs of Willem de Kooning and Franz Kline. Her early works are characterized as turbulent and related to personal bereavement. This turbulence is often expressed in opposites: dense versus transparent strokes, warm versus cool palettes, gridded structure versus chaos, and choppy versus continuous brushstrokes. Working for the most part on multiple panels or large-scale canvases, she strived to evince a natural, rather than constructed, rhythm from the composition, which emanated from the expansiveness of her gesture and from her uninhibited use of color. Mitchell received her BFA and MFA from the School of the Art Institute of Chicago before establishing herself as a formidable talent in postwar New York's avant-garde scene. In 1951, her work was exhibited alongside that of Jackson Pollock, Willem de Kooning, and Hans Hoffman in the celebrated. 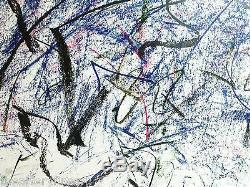 , which marked the ascendancy of Abstract Expressionism within the development of modern art. Exemplifying the ideals of the New York School, Mitchell's paintings wager all on the expressive potential of the painterly mark itself, freed from the constraints of traditional representation. Given the macho posturing for which the movement's adherents have earned a reputation almost all of them were men Joan Mitchell's prowess in this milieu is all the more remarkable. She has since been the subject of numerous museum exhibitions, and examples of her paintings and editioned prints hang in nearly all major public collections of modern art. Mitchell left New York and the United States for France in 1959. After spending the better part of a decade in Paris, she relocated to Vétheuil, France in 1968, a town on the Seine about 40 miles north of the capital. There in her studio she embarked upon a body of work whose subject matter derives from the sunflowers and natural beauty that thrive in the golden sunlight of the Seine valley. She would return to this source material periodically throughout the rest of her career. This series of stamps honored the artistic innovations and achievements of 10 abstract expressionists, a group of artists who revolutionized art during the 1940s and 1950s and moved the U. To the forefront of the international art scene for the first time. The stamps went on sale March 11, 2010. As of May 2, 2018, the David Zwirner Gallery is the exclusive worldwide representative of the Joan Mitchell Foundation. The celebrated Abstract Expressionist Joan Mitchell is getting a major retrospective courtesy of the Baltimore Museum of Art (BMA) and the San Francisco Museum of Modern Art (SFMoMA), starting in 2020. Organized by the BMAs Katy Siegel and SFMoMAs Sarah Roberts, the show will mark the first survey dedicated to Mitchell in the U. In almost two decades, and promises to open an exciting new chapter in the reevaluation of her achievement as a major painter. , San Francisco Museum of Modern Art (SFMoMA), San Francisco, CA (September). , Baltimore Museum of Art (BMA), Baltimore, MD (April). Epic Abstraction: Pollock to Herrera. (group exhibition), Museum of Modern Art (MoMA), New York, NY (12/17 - ongoing). Mitchell / Riopelle: Nothing in Moderation. , Fonds Hélène & Édouard Leclerc pour la Culture, Landerneau, France (12/9/2018 - 3/10/2019). Joan Mitchell: Paintings from the Middle of the Last Century, 19531962. , Cheim & Read Gallery, New York, NY. (group exhibition), Yokohama Museum of Art, Yokohama, Kanagawa, Japan. (group exhibition), Museum of Modern Art (MoMA), New York, NY. (group exhibition), Nagoya City Art Museum, Nagoya, Japan. Hot Sun, Late Sun: Untamed Modernism. (group exhibition), Fondation Vincent van Gogh, Arles, France. The Water Lilies: American Abstract Art and the Last Monet. (group exhibition), Musée de lOrangerie, Paris, France. , Art Gallery of Ontario (AGO), Toronto, Canada. , Musée National des Beaux-arts du Québec, Canada. (group exhibition), Whitechapel Gallery, London, UK. Making Space: Women Artists and Postwar Abstraction. (group exhibition), Palm Springs Art Museum, Palm Springs, CA. Nothing and Everything: Seven Artists, 1947 1962. (group exhibition), Hauser & Wirth, London, UK. Joan Mitchell: Drawing into Painting. 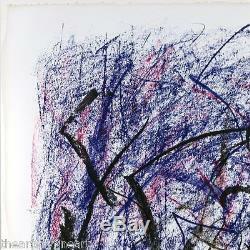 Visual Poetry: An Exhibition of Abstract Expressionist Prints by Joan Mitchell. Keogh Art and Design, Jamestown. (group exhibition), Mint Museum, Charlotte, NC. (group exhibition), Denver Art Museum, Denver, CO. Joan Mitchell : Retrospective - Her Life and Paintings. Joan Mitchell: At the Harbor and in the Grande Vallée. Edward Tyler Nahem Fine Art, New York, NY. Joan Mitchell: Retrospective - Her Life and Paintings. Figure Ground: Joan Mitchell, Willem de Kooning and Raoul Hague. Joan Mitchell: The Sketchbook Drawings. 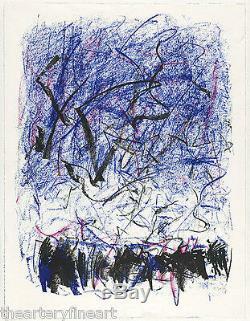 Joan Mitchell: The Black Drawings and Related Works 1964 1967. Hans Hofmann - Joan Mitchell - Sam Francis. , Galerie Thomas Modern, Munich, Germany. , Galerie Max Hetzler, Berlin, Germany. 2012' Elles: Women Artists from the Centre Pompidou, Paris' (group exhibition), Seattle Art Museum, Seattle, WA' Contemporary Prints by American Women: A Selection from the Gift of Martha and Jim Sweeny' (group exhibition), Museum of Fine Arts, St. Petersburg, FL' Joan Mitchell: The Last Decade', The Butler Institute of American Art, Youngstown, OH' Joan Mitchell: The Last Paintings', Hauser & Wirth, London, UK. 2011' Joan Mitchell: The Last Paintings', Cheim & Read Gallery, New York, NY' No Rules: East 9th Street Revisited, 1951 - 2011' (group exhibition), Dorian Grey Gallery, New York, NY' Joan Mitchell: Paintings from the Fifties', Lennon, Weinberg, Inc.
New York, NY' Tibor de Nagy Gallery Painters and Poets' (group exhibition), Tibor de Nagy Gallery, New York, NY' Willem de Kooning & Joan Mitchell: Editions', Mary Ryan Gallery, New York, NY. 2010' Joan Mitchell: The Last Decade', Gagosian Gallery, Beverly Hills, CA' Abstract Expressionist New York' (group exhibition), Museum of Modern Art (MoMA), New York, NY' Joan Mitchell', Inverleith House, Edinburgh, Scotland' Le Tableau: French Abstractions and its Affinities' (group exhibition), Cheim & Read Gallery, New York, NY' Monet and Abstraction' (group exhibition), Musée Marmottan Monet, Paris, France' Le grand geste! Joan Mitchell: A Discovery of the New York School. New York, NY' Significant Form, The Persistence of Abstraction' (group exhibition), Maly Manege State Exhibition Hall, Moscow, Russia' Monet, Kandinsky, Rothko and the Aftermath: Paths of Abstract Painting' (group exhibition), BA-CA Kunstforum, Vienna, Austria' Action Painting' (group exhibition), Beyeler Museum, Basel, Switzerland' Empires and Environments' (group exhibition), Rose Art Museum of Brandeis University, Waltham, MA. 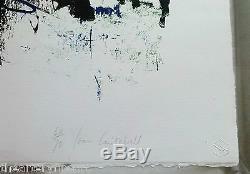 2007' Abstract Expressionist Prints' (group exhibition), Worcester Art Museum, Worcester, MA' The Passionate Gesture Works' (group exhibition), Hackett-Freedman Gallery, San Francisco, CA' Joan Mitchell: Leaving America', Hauser & Wirth, London, UK' Joan Mitchell: Works on Paper 1956 - 1992', Cheim & Read Gallery, New York, NY' Joan Mitchell: The Last Prints', Susan Sheehan Gallery, New York, NY. West Palm Beach, FL' Joan Mitchell: Prints from the Foundation', Susan Sheehan Gallery, New York, NY. 2005' Joan Mitchell: Frèmicourt Paintings 1960-61', Cheim & Read Gallery, New York, NY' Joan Mitchell: Sketchbook 1941 - 1951', Francis M. Naumann, New York, NY' Quartet: Johns, Kelly, Mitchell, Motherwell' (group exhibition), Walker Art Center, Minneapolis, MN. 2004' Joan Mitchell Larger than Life: Lithographs from the 1980s and 1990s', Mary Ryan Gallery, New York, NY' The Paintings of Joan Mitchell', The Phillips Collection, Washington, DC. 2003' The Paintings of Joan Mitchell', Modern Art Museum of Fort Worth (MAMFW), Fort Worth, TX' The Paintings of Joan Mitchell', Birmingham Museum of Art, Birmingham, AL. 2002' The Paintings of Joan Mitchell', Des Moines Art Center, Des Moines, IA' The Paintings of Joan Mitchell', Whitney Museum of American Art, New York, NY' Joan Mitchell: Petit', Lennon, Weinberg, Inc. New York, NY' Joan Mitchell: The Presence of Absence', Cheim & Read Gallery, New York, NY' Joan Mitchell: Working with Poets', Tibor de Nagy Gallery, New York, NY. PLEASE SEE MY OTHER AUCTIONS BY CLICKING MY. 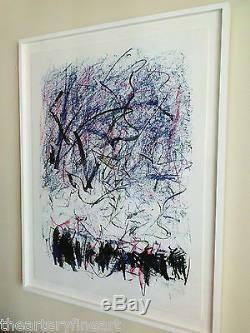 The item "JOAN MITCHELL'Bedford III' 1981 SIGNED Lithograph Limited Edition Print Framed" is in sale since Saturday, July 9, 2016. This item is in the category "Art\Art Prints". 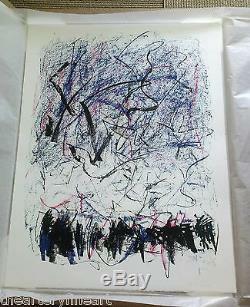 The seller is "thearteryfineart" and is located in Miami, Florida. This item can be shipped to United States.